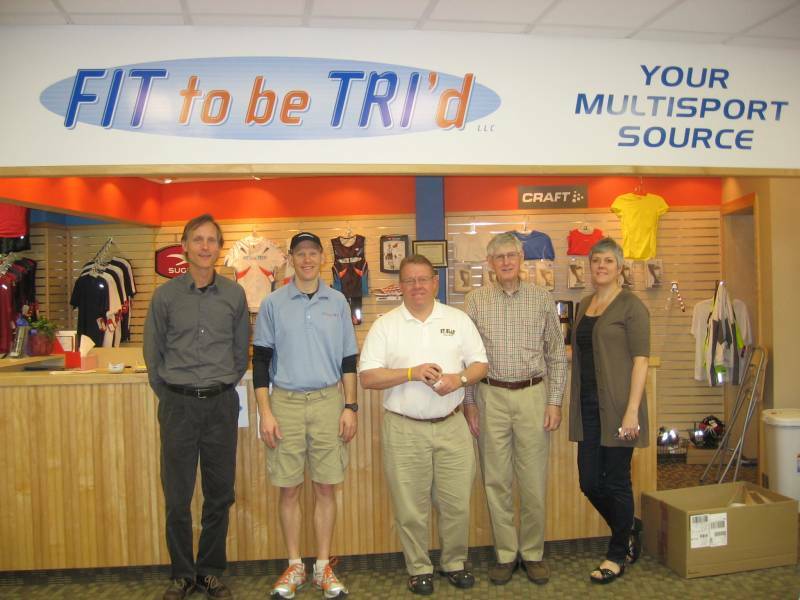 The April Board Visit was to a relatively new business in downtown, Fit to be Tri’d. Owner Tom Bisel told the NDDC visitors that no matter what their fitness goals, he has the products and the knowledge to help achieve them. Tom is a long-time area resident. He looked at several locations in the “greater” metro area, including many that were cheaper, but chose Northfield. He said the community has a good reputation for specialty retailers and that people will travel a considerable distance for certain stores. Tom believes that he can attract customers from both the Twin Cities and Rochester, as well as informed athletes from around the state. His strategy is to back his quality products with the information necessary to help you succeed. As for things that could be improved about downtown Northfield, Tom mentioned lighting. He said not only are the streetlights rather inadequate, there’s also relatively little lighting on signs or buildings when compared to other towns around Minnesota. Tom offered a number of new ideas to the NDDC Board. To build better connections with the college students, he suggested a business showcase on the campuses in early October. To raise awareness of his business, and to bring some people downtown, Tom proposed the Northfield 1-miler during the Taste of Northfield. He’s definitely a new burst of creativity in downtown. Just check out his model website at Fit to be Tri’d.